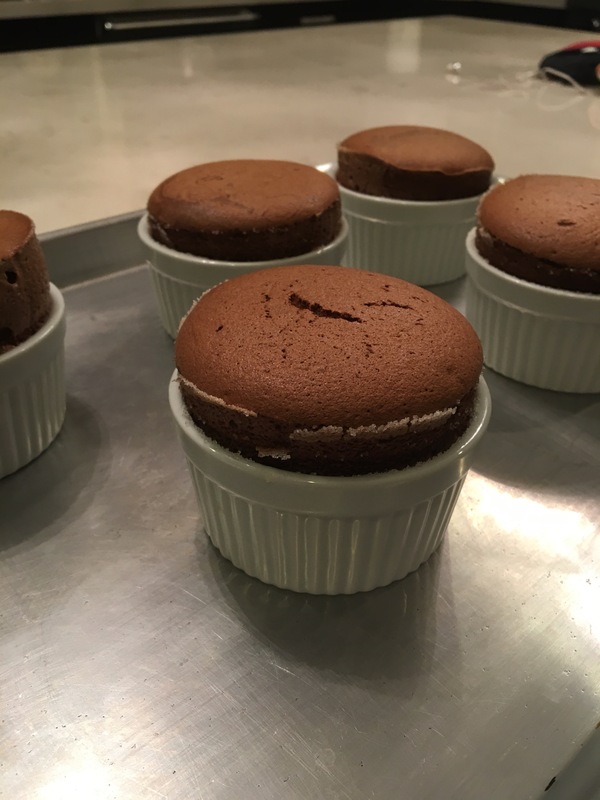 These individual chocolate soufflés are heavenly- light, fluffy, and rich all at once! They’re sure to please any crowd. This recipe’s adopted from Martha Stewart’s version. Coat 5 individual ramekins in butter and then roll with sugar until completely covered. In a bowl, beat egg whites until bubbly. Add the cream of tartar and beat until the first peaks start to form. Then add the remaining sugar and beat until stiff peaks have formed. In a saucepan, stir together milk, cornstarch, salt, and vanilla extract until milk begins to thicken. Stir into chocolate. Add the yolks and half and half. Stir until well combined and then mix in the egg whites. Divide mixture evenly between the ramekins. Place all on a cookie sheet and place in a 400 degree oven for 13 minutes. Eat immediately.